Plan your summer vacation to Austria and get close to nature! 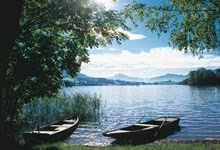 A vacation in Austria gets you close to nature and allows you to get to know the people and the wonderful traditions. Austria's landscapes are incredibly varied and the options are endless. Be it a relaxing walk or experiencing the great outdoors in the Austrian Alps. Keep in mind that you are never far from historic city centers, cultural events and gourmet restaurant.